My best friend Sylvain did a drawing of a boat. When he gave it to me, he asked that when he passed, if I would make a boat for his ashes. He died a month later and I carved a boat as close to Sylvain's drawings as possible. 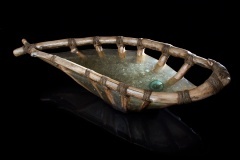 My mother came to Sylvain's funeral and when my father passed, she was so moved by the boat she wanted my father's remains put in a similar vessel. Since he was a Norwegian fisherman and boat builder, we buried the boat at sea, like a Viking funeral. Two years later when my Mother passed I created a boat for her ashes and buried it with my father at sea. The day before John, my partner of twenty-four years, passed, he asked me to make a boat for his ashes. His wish was to be buried at sea with my parents. In the course of eight years, I had tragically lost and made funeral boats for everyone close to me. Since that time I have created funeral boats for friends, family, and pets. Art school never prepared me to work with human or animal ashes but I feel honored to have this opportunity. When I work with them, I feel transformed to another place or another time where an artist was asked to be both craftsman and mortician. Watch "Art as Voyage: Steve Jensen's Nordic Heritage" from KCTS-9 to learn more about this collection of work. Sponsored in part by Rubatino Refuse Removal, Inc.